Our Good Friends – Stirling Council to the rescue! A week after the Glasgow Convention, we had just finished our 2 hour juggling club and were sat in the pub, when we decided that we should hatch a plan to get ourselves to BJC. Most of the guys at the juggling club are also volunteers at Off The Record, which is a confidential Youth drop-in centre, and as such, they knew about which grants we could apply for. We met up with a representative from Stirling Council, and after several weeks of negotiating, she had agreed for the Council to pay for the 6 of us to travel down to Kent from Stirling (£60 each) and pay for our tickets (another £60)! They also provided some of us with a loan of camping equipment, and paid for enough food for 2 people!! Thursday – getting there and settling in! Andy, Duncan, Ewan, Steve Dobinson, Steve (me) and George made it all the way from Stirling to BJC on the Thursday night just after the camp site opened. Duncan gave me a book about Mulla Nasrudin (wise stories which have deeper meanings) to read on the journey down, so I gave him a Christian clowning book to read also! I had never been camping before, so once all the other guys had set up their tents (as darkness fast set in) they eventually stopped taunting me enough to lend a hand and get my tent up too! We then proceeded to the beer tent where we remained for most of the night, meeting and greeting everyone as they arrived, and purchasing of much alcohol from Tesco’s 24hr shop round the corner! I met two guys called Jon and Eric and chatted to them for most of the night. When the beer tent closed, most of us moved to the UV hall and the guys drank more until it too closed! Graham Benson (from Glasgow Juggling Club) had brought the Stirling Posse a case of beer which we shared out amongst our new friends! I also got a shot of Devil Stick Peat’s glow balls! I had stopped drinking long before everyone else and went to bed at 3.30am. I had always thought that I would be freezing cold in a tent, but I was surprised at how warm I was and how easy it was to drop off to sleep, until the other guys arrived back at their tents (beside mine) and preceeded to draw lots of nice windows and decorations on my tent (using the frost on the tent and their fingers)! I managed to catch a little of the Alexis and Tweedy Clown show, and have to admit (like many other people have commented) that although I don’t really like clowning much, these guys had me enthralled and I enjoyed the show! The Fireworks display was really good. I filmed some of it, but my camera battery ran out, and then later on, I needed to scrub the film to make way for some movies taken at the parade! I was filming with the same hand as I had a bottle of bacardi breezer in, and when I followed a firework into the sky, I spilled half the bottle down my shirt!! A band called Chu Nah Mi were playing in the school gym. They are a Ska band, and had everyone dancing! Excellent music. I can relive those memories, as I bought their CD! A bit of a mouthful! I guess we all thought that this would be loads of fun, but little did we realise that it would involve us all filing into a hall, and waiting for the hall to fill up with people (we needed 500 and only got 411). By the time we got everyone into the hall, I had been standing for over an hour. It was then announced that we had to go through the barriers one more time to be counted at which point a lot of people just left. It was then announced that the world record attempt was over, but that we could just help ourselves to the tequila (which we all did of course)!! As a Christian in a mainly non-Christian environment, over this holy weekend, I did find it difficult. On the Sunday back home, several of my Youth Group were getting baptised, and I was disappointed that I couldn’t be there to share in their special occasion. I didn’t get drunk, but still partook in the drinking up to a certain limit. I did my bible study in the 24hr Juggling Hall so that I wasn’t separating myself from everyone else. Great, but not as easy as it looks! First time I had tried a snakeboard before. The gym hall had been taken over, so we had to practice outside on a hilly piece of ground which didn’t help us much! Break-Dancing Ouch, some of those moves hurt! Miguel was really cool, and showed some awesome moves, but after 45 minutes of trying this out, I decided to just find a bench and watch the class rather than take part! Learned a few cool new tricks here that I had never thought of before! Excellent fun. Many years ago, I had auditioned at Circus Space for their BTEC Performing Arts course, and did really badly on the trapeze, so I was keen to go to this class and prove I could do better. I learned about 10 basic trapezing moves including one called the Crucifix, which I performed on Good Friday, while wearing a Crucifix T-Shirt – a great chance to witness to those around me!! I hadn’t used my stunt stick for years, so this was a good refresher course! I re-learned some tricks such as propellors and buzz saw. Practiced juggling the three sticks also. Watched in amazement as I saw all the tricks you can do using your feet during stunt stick work! Amazing kickups, and catches! Learned some more snakeboarding and improved on yesterday. Glyn again showing some wonderful tricks I am still trying to learn. I got some of them on video though and managed to vastly improve my behind the back throws. I managed to make it to all 3 renegade shows, which took place in the No Fit State Circus Tent. The shows got better as the weekend went on, as Fridays ended up quite morbid near the end. Peewee was a most excellent compere, and he kept us all amused (especially when he accidentally swigged some of Dr Bob’s Chili Vodka) and couldn’t speak for quite a long time! Incidentally, when Peewee went backstage, someone offered him a handkerchief which they had doused in chili vodka, so he felt even worse by the time he came back onstage!! Vodka Chili: I tried a sip of it, and my nose exploded (blood everywhere)! If I had done this on stage, instead of in the stands, I am sure I would have got an applause and possibly a prize, but I had to settle for running out of the tent with blood dripping everywhere, and heading to the toilets to bung my nose with tissue and clean up! Poetry: Peewee had introduced poetry reading into this year’s renegade, in an attempt to keep the number of acts high, as numbers had been dropping off in recent years. His plan worked, as by the final day, there were so many poets storming the stage, that the renegade shows went on for many many hours!! Andy and Steve Dobinson both went on stage several times to recite their own poems. Most memorable would be Betty’s poem, which got a rousing round of applause. The poem started off lovely, and then when out of the blue she used the F*** word, the crowd went wild, and she won the star poetry prize that night! Eat the Cheese! 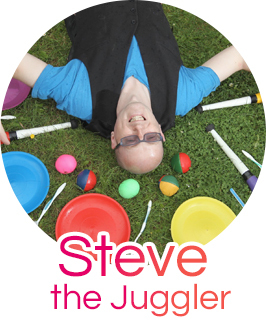 : On the Saturday’s renegade show, the Stirling Juggling Project sat up the back with some cheese, wine and crackers. For a laugh, Ewan stormed the stage and demanded that Peewee “Eat the Cheese”. Peewee didn’t want to eat cheese handed to him from a complete stranger, but by this time, the crowd had gotten behind Ewan and a chant was started which would last the rest of the Convention! Night Fever – two guys dressed in 70’s gear performing 3 ball tricks and fitting in dance moves to comic effect! Andy did the flight of the bumblebee on his teeth, then Peewee did the song by hitting his head! Zanzibar – one of the best renegade performances, despite the lack of music which he had specially choreographed his routine too. His tricks with 2 diabolo’s were totally inspiring for everyone. Fire balls! – Some guys who had never used fireballs before, came onstage, lit them up, and then kept dropping them onto the floor as they had no idea what they were doing and kept burning themselves! While they did this, a guy did a little firestaff spinning in the background. He was asked back onstage by himself and was absolutely fantastic! 12foot neon lit wolf! – hard to describe, but very memorable! Ewan monkeying around – Ewan took his monkey and unicycle on stage, and did some unicycling and certain unprintable things with his monkey friend! By the time I had got up on the Monday, everyone else from Stirling Juggling Project (except Ewan who wanted to hang around) had left. Although I had trouble putting the tent up (with it being my first time), I found it very easy to pack the tent and all my belongings, and caught the train with Gabi into London Victoria Street. I then made the rest of the journey home by myself. It took 9 hours to get home, and when I arrived home, everyone was surprised to see me as I had told them that I wasn’t coming home till the Tuesday! My first big convention was fantastic. I met a load of wonderful people, and made lots of useful contacts also. Stirling Juggling Project bonded well and really looked out for each other throughout the Convention. The workshops were fantastic, and I even learned a lot by just going along to the juggling hall and watching people juggle. I can’t wait till next years convention which is being held in Brighton!! Stirling Council – we couldn’t have done it without you (especially the huge grant you gave us to get there)! Steve and Andy – we stuck together and helped each other out throughout the whole convention – may the bad puns continue! (I am a board made out of fish… what am I? – a SKATEboard)! Liz – for the wee party on Sunday night, and the chats we had!